Another driving day with a few interesting stops on the way. 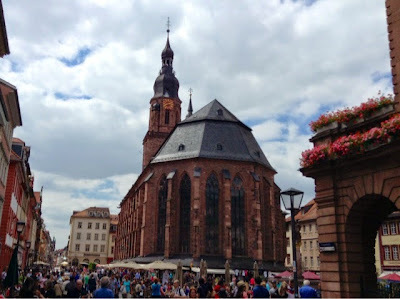 We passed into Germany again and made a stop in Heidelberg. It seemed like quite a pretty little town, but we only had enough time there to grab a quick lunch, before piling back on the coach. We've also left the Alps now, so the scenery is still nice, but less spectacular. 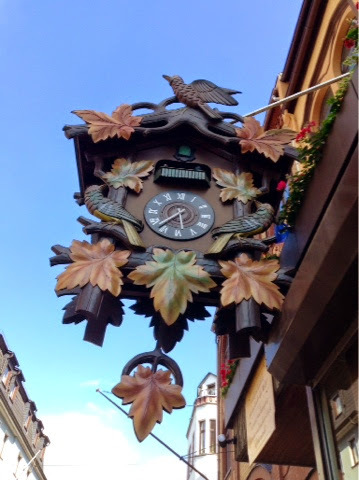 We arrived in the town of St Goar later in the afternoon, where the first thing we did was visit a beer stein shop. We had a talk about how they're made, which was pretty interesting, and the designs the shop had were very detailed. I particularly liked the special Contiki design they had, but they were all a bit expensive. We also had a look in the cuckoo clock shop across the road, which had some great stuff too, including the world's largest free-standing cuckoo clock. After dinner we went to the optional wine tasting, which was held in a 17th century cellar, a very cool location! I usually quite like wine, but these were a bit too sweet for me. It was still fun though and put us in a good mood for the evening. It was a quiet night in for everyone though, just a few drinks at the hotel bar - we all want to be well rested for Amsterdam tomorrow!